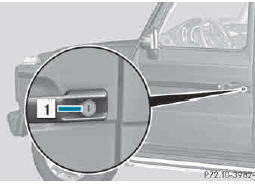 If the vehicle can no longer be centrally unlocked with the SmartKey, use the mechanical key. Take the mechanical key out of the SmartKey . ► Turn the mechanical key counter-clockwise to position 1.